Mi Shell Obrahma, originally uploaded by hep. 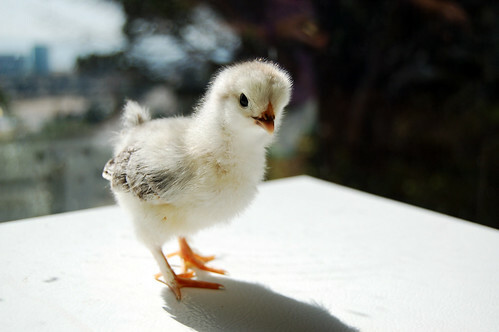 This is the last chick. It is a brahma chick, so we named it Mi Shell Obrahma (tentatively also named Bwrack Obrahma should it turn out to be a rooster but based on its tiny chick personality i am 99.9% sure it is a hen.) it is by far the most sweet and docile of the chicks, but also screams the most shrilly if you remove it from sight of its fellow inmates. This chick belongs to Zoe. Brahmas are funny because they have a trail of feathers that runs all the way down their legs which makes them look as if they are wearing feather chaps. Once the chicks pinfeathers and real plummage comes in these featherchaps also grow in and become even more elaborate. omg, that chicken looks crazy!